There are two basic types of electrical distribution sub-panels. Those that are designed to supply power to a single appliance or device such as an air conditioner and are termed a Disconnect Switch . For an air conditioner it would be an air conditioner (AC) disconnect switch . These primarily act as location specific electrical disconnects for that specific appliance or device. Those that are designed with a number of circuits to power numerous electrical receptacles appliances or other devices. This article covers the 2nd item - Those sub-panels that are designed with a number of circuits to power numerous electrical receptacles appliances or other devices. The primary purpose of an electrical sub-panel is to provide you with additional electrical circuits. It does not change the total amount of power available to the home. In other words, adding an extra eight 15 amp circuit positions does not mean that your home can draw an additional 120 amps of power. The total amount of power that your home can draw from the electrical utility is based on the electrical service (the size (wire gauge) of the wires connecting your home and the main disconnect circuit breaker or fuses. The primary difference between a main electrical distribution panel and a sub-panel is in the main disconnect. Modern electrical distribution panels have a main disconnect circuit breaker built into them, see Figure 1. 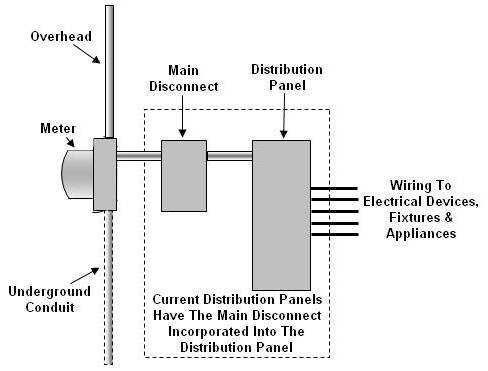 Figure 1 - Home electrical service before the addition of a distribution sub-panel. Whereas the sub-panel is generally powered from a circuit breaker within the load center or main distribution panel and does not have its own disconnect associated with it. There are two primary reasons to consider the installation of an electrical distribution sub-panel. Your current electrical distribution panel (load center) does not have any vacant spaces for the addition of more circuit breakers. You need multiple circuits in a distant location, such as a garage, greenhouse or workroom. 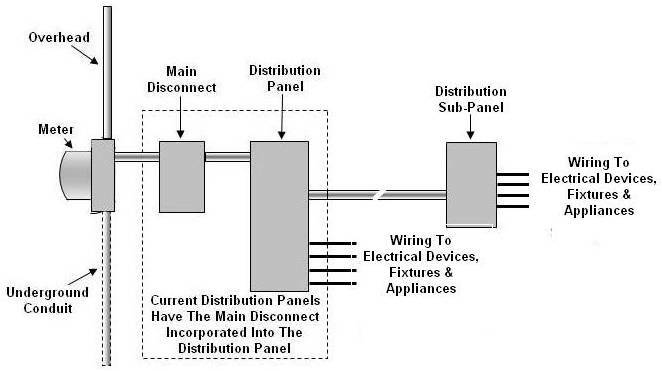 The installation method for both of the aforementioned variations is the same, the only difference is the length of the wires from the main distribution panel to the electrical sub-panel, see Figure 2. Figure 2 - Home electrical service after the addition of a distribution sub-panel.